Cnoc Na Gaoithe is a newly renovated 2 bed cottage on the Quay Road just 2 min walk from the town, harbour and the Greenway. Facilities include: 1 double en suite bedroom; 2nd room sleeps 3 (1 single bed & one set of bunk beds); free to air satellite; solid fuel stove & central heating (fuel supplied); main bathroom; fully fitted kitchen including hob, oven, microwave, dishwasher, washing machine & dryer; Large garden and off street parking. 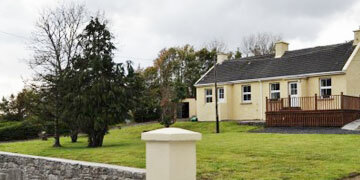 The listing of holiday accommodation on this website does not constitute or imply an endorsement by the owners of the newportmayo.ie website. We make no representations or warranties of any kind, express or implied, about the quality, availability or suitability of these properties. Any reliance you place on such information is therefore strictly at your own risk. 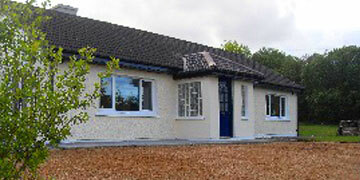 Through this website you are able to link to other websites which are not under the control of newportmayo.ie. We have no control over the nature, content or availability of those sites. The inclusion of any links does not necessarily imply a recommendation or endorse the views expressed within them. Newport, County Mayo, is a picturesque town nestling on the shores of Clew Bay with the Brown Oak River flowing through its centre. 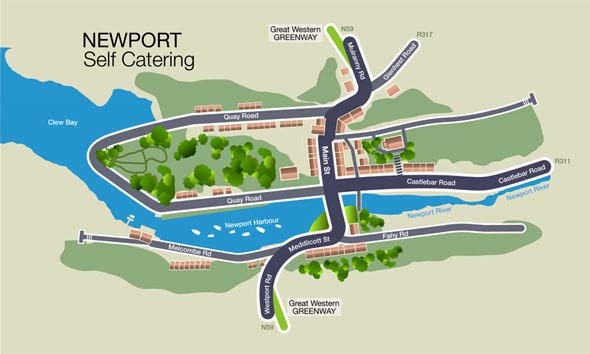 The Greenway is a 42km walking and cycling trail which passes through the picturesque town of Newport.